After a 10-year run in Indiana to begin her career, January joined the Mercury in free agency last season and proved to be an excellent complement to Diana Taurasi in the backcourt. In addition to providing her typical sound defense, the 5-foot-8 January paced the league in three-point efficiency (47 percent) for the second time in her career. Expect January to again fill a starting role while being tasked with hounding the opposing team's top perimeter threat game in and game out. January apparently suffered the initial injury during training camp last season and played the entire 2018 campaign with the injury. She did average a nine-year low in scoring at seven points per game last season, so she might be in store for a resurgent 2019 season now that her shoulder will be better off. January collected two points (1-6 FG, 0-3 3Pt), four rebonds and four assists in the 91-87 playoff loss at Seattle on Tuesday. January struggled from the floor immensely in the loss Tuesday, shooting a mere 16.7 percent over six field-goal attempts en-route to just two total points. This postseason, the 5-8 point-guard is averaging 6.5 points and 3.8 assists over four games. January recorded 10 points (4-8 FG, 2-5 3Pt), three rebounds, two assists and one steal in Sunday's 91-87 playoff loss versus the Storm. This was the highest scoring playoff game January has had this postseason as she dropped 10 points on 50.0 percent shooting while knocking down two three-pointers. Over three games in the 2018 WNBA Playoffs, the Arizona State product is averaging 8.0 points and 3.7 assists per outing. January had six points (2-6 FG, 2-3 3Pt), four assists, two rebounds and one steal in the 101-83 home playoff victory against the Wings on Tuesday. Despite shooting 33.3 percent overall, January had a decent performance from the three-point line, as she finished two-of-three from deep to total six points Tuesday. Throughout 33 games played in the regular season, the 31-year-old averaged 7.0 points, 3.3 assists and 2.1 rebounds per contest. January erupted for 20 points (7-13 FG, 4-5 3Pt, 2-3 FT), five assists, three rebounds, two steals and one block in the Mercury's 101-87 loss against the Sky on Wednesday. January took advantage of the absence of suspended star guard Diana Taurasi and dropped a season-best 20 points on 53.8 percent shooting while draining four three-pointers Wednesday. Over 25 appearances this year, the 31-year-old veteran is still averaging a career-worst 6.5 points per contest however. January (foot) posted three points (1-2 FG, 1-2 3Pt), two rebounds, two assists and a steal across 24 minutes Thursday against the Sun. January, who has been playing through a foot injury, was probable for the contest, so her appearance didn't come as much of a surprise. In her 18 games this season, she's averaging 6.9 points, 3.7 assists and 2.2 steals across 27.1 minutes. January (foot) is listed as probable for Thursday's tilt with the Sun, Andrew Joe Potter of The Score reports. January has been playing through a foot injury of late and was limited to just 16 minutes the last time on the court. As a result, it may be wise to avoid the 5-foot-8 guard on Thursday for fantasy purposes, even if she's cleared to play as expected. Look for final word on her availability on game day and for the season, January has averaged 7.1 points, 2.2 rebounds and 3.8 assists across 27.3 minutes. January (foot) is active for Saturday's matchup with the Mystics, Andrew Joe Potter of the Score reports. Even though she will be ready to play and in uniform, it's currently unclear if she'll receiver her average allotment of minutes after missing the team's game Friday. 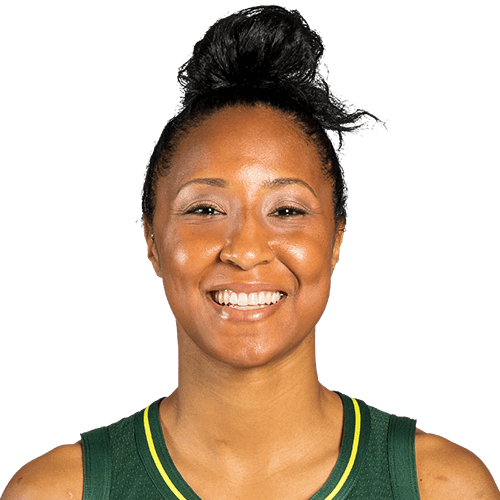 Now in her tenth season in the WNBA, January is only averaging 7.4 points, her lowest total since she averaged 7.4 points in 2010 with Indiana, despite currently shooting at a career-best 43.2 percent clip. January (foot) will not play in Friday's game against Indian, Jeff Metcalfe of the Arizona Republic reports. January's scoring output has declined this season compared tot he past couple, but she still has contributed 7.4 points and 3.9 assists and has seen a minor bump on the boards to 2.3 per game from 1.5 last season. The lessened scoring early in the season isn't a result of decreased efficiency from the field, however, as she has knocked down a career-high 43.2 percent of her shots thus far. Yvonne Turner will receive the start in her place Friday, while January's next opportunity to take the floor arrives Saturday against Washington. Born: January 11, 1987 in Spokane, Wash.
2017: In her ninth pro season, January averaged 9.5 points, 1.5 rebounds and 3.9 assists per game while seeing action in only 25 games due to a pair of nagging leg injuries…she still earned her sixth straight selection to the WNBA All-Defense Team while averaging just under a steal per game (0.92)…she scored a season-high 23 points in a narrow defeat at Seattle in the season opener, 5/14. 2016: January averaged 9.7 points, 1.8 rebounds and a career-best 4.7 assists per game…she appeared in 29 games and started 27, after missing the first five games of the season while recovering from offseason knee surgery…named to the WNBA All-Defensive Team for the fifth straight season, she finished fourth in the WNBA in assists, fourth in assist-to-turnover ratio (2.67) and eighth in 3-point percentage (.392)…she became the third player in Fever history to reach the 2,000-point plateau, against Minnesota, 9/16…she missed the second double-double of her career while finishing with 12 points and a season-high nine assists in a win over Los Angeles, 7/19. 2015: Named to the WNBA All-Defensive Team for the fourth straight season, she started in 29 games, missing five games late in the year with knee and back pain following a collision against Atlanta, 8/28…she posted season averages of 8.1 points and 3.4 assists per game, and led all WNBA players with 25-of-58 (43.1%) shooting from 3-point range…she averaged a steal per game and posted at least 30 steals for the sixth time in her career…she tied a career high with four steals at Atlanta, 6/16. 2014: The Fever point guard earned her first Eastern Conference Player of the Week award and was later rewarded with her first All-Star appearance…she was one of three Fever stars to average double-figure points, scoring at a 10.3-point clip while averaging 3.7 assists per game…in May, she hit seven straight 3-point field goals to set a franchise record, and in three straight home games, the streak reached eight-in-a-row to earn her first player of the week award with back-to-back 20-point games against Connecticut, 5/29, and New York, 5/31…representing the East in the All-Star Game in Phoenix, she scored nine points with three 3-pointers, and added four assists. 2013: Named to the WNBA All-Defensive Team for the second time, January started in 32 of the Fever’s 34 games while averaging 9.8 points and 3.7 assists…she averaged 15.5 points over her last four regular season games, reaching double figures in each…returning from a stomach illness two nights earlier, she blitzed Chicago, 9/6, with a career-high 23 points and a career-best five 3-pointers, shooting 8-of-16 from the floor and 5-of-7 from long distance…she had nine points while matching a season-high seven assists at Minnesota, 8/24…she scored 14 points on 6-of-11 shooting from the floor and a career-high seven rebounds against Connecticut, 7/6. 2012: January played in 31 games, starting in 26…she missed the last three games due to a concussion suffered at Minnesota, 9/17…she averaged 10.3 points, 1.8 rebounds 3.9 assists and 1.2 steals for the season…she had the sixth-best 3-point shooting percentage in the WNBA (.430) and made a career-high 46 3-pt FG…her best game featured a career-high 22 points, shooting 8-of-15 from the field and 3-of-6 from behind the arc against Phoenix, 8/25…she received her first league honor while named to the WNBA All-Defensive First Team. 2011: January started the team’s first ten games before tearing her right ACL and missing the remaining 24 games…she recorded her first career double-double with 12 points and 10 assists vs. Tulsa, 6/14…she had a career high four steals vs. Chicago, 6/4…she finished her season with averages of 8.6 points and 5.0 assists per game. 2010: January appeared in 30 games with seven starts…initially thrust into the starting lineup for the Fever’s first two games, she served mostly as a spot starter and top backup to veteran point guard Tully Bevilaqua…she averaged 7.4 points, 2.0 rebounds and 3.1 assists for the season…her top game featured season highs of 19 points and eight assists, while hitting 14 of 15 free throws at Washington, 7/24…she had a second game with eight assists at Phoenix, 8/8. 2009: Indiana’s first-round pick started four of 33 games in which she appeared…she averaged 6.9 points, 2.3 assists, 1.9 rebounds and 1.09 steals per game…she posted a season-high 17 points against Detroit, 8/15…she had nine double-figure games and had a season-high six assists in three different games…among WNBA rookie rankings, January was second in assists and steals, fifth in free throw percentage and seventh in scoring and minutes per game. January has reached the WNBA Finals on three occasions and averaged double-figure scoring throughout the playoffs in each of those seasons…she averages 10.7 points and 3.8 assists through 43 playoff games overall…January and the Fever have never failed to reach the playoffs…she is tied with Becky Hammon for ninth in WNBA postseason history with 173 career assists. 2016: January nearly collected the first postseason double-doule of her career, finishing with 12 points and nine assists during a first-round loss to Phoenix. 2015: January appeared in the WNBA Finals for the third time in her career, guiding Indiana to a 5-game series with Minnesota while averaging 11.3 points and 5.0 assists through 11 postseason games…she posted a postseason career-high eight assists in three different games, and corraled a playoff career-high six steals in a decisive Game 3 of the East Finals at New York, 9/29…she scored 19 points against the Lynx in Game 1 of the Finals, and reached double figures in every game, averaging 15.4 points in the series…she played through a torn meniscus during Game 5, however, which resulted in offseason surgery. 2014: January averaged 12.8 points over five games in the East Semis and East Finals…she had 19 points with three 3-pointers in a Game 1 win over Chicago in the East Finals. 2013: January started in all four playoff games, finishing with a team-high 3.5 assists and adding 7.5 points per game…she had playoff highs of 16 points and six assists in the win at Chicago, 9/20, finishing 3-of-4 from long-range…she tied her playoff career high with five rebounds in the loss against Atlanta, 9/29. 2012: January started all 10 Fever playoff games…she averaged 11.5 points, 2.3 rebounds, 1.6 steals and a team-high 3.8 assists…she reach double-figure scoring in seven of the 10 games, including a 15-point, two-rebound and three-assist performance in Game 4 of the Finals against Minnesota, 10/21…she held All-Star and Olympian Seimone Augustus to single-digit scoring in each of Games 3 & 4 of the Finals to mark only the third and fourth time that had been done all season…her finest game may have been a 24-point, 7-assist effort at Atlanta in Game 2 of the East Semis, 9/30. 2011: She missed the playoffs due to a season-ending injury. 2010: In three games against New York, she averaged 6.7 points and 2.0 assists per game. 2009: As a rookie, January appeared in all ten Fever playoff games…she averaged 10.6 points, 3.0 assists and 2.4 rebounds per game…she scored in double figures in five of 10 playoff games, including 16 or more points on three occasions…she led the team in 3-point percentage and was second on the team in free throw percentage…January averaged 12 points per game in the WNBA Finals…in Game 3 of the WNBA Finals against Phoenix, 10/4, she had a playoff-high 17 points…in Game 1 of the Finals at Phoenix, 9/29, she had 11 points and seven assists. 2014-15: In 31 games with Adana ASKI in Turkey, she averaged 16.5 points with 4.0 assists per game, playing alongside Fever teammate Erlana Larkins. 2013-14: January averaged 12.3 points and led the Brazilian League with 4.4 assists while playing for Maranhao Basquete. 2012-13: January averaged 11.4 points, 3.2 rebounds and a league-leading 5.7 assists while playing for Ramat Hasharon Electra in Israel. 2010-11: She joined Raanana Hertzeliya of the Israeli League at mid-season and helped the club to the semifinal round of the playoffs…she averaged 14.5 points and 5.5 assists while sparking the club to a 7-4 regular season mark upon her arrival…she was named all-league honorable mention. 2009-10: January played with Tarsus in the Turkish League. 2013-15: January was a member of the USA Basketball Women’s National Team Pool for 2014-16. The 2008 and 2009 Pac-10 Defensive Player of the Year, she was a First Team All-Pac 10 selection in 2009 and an honorable mention All-America pick as a junior and senior…she ended her career as Arizona State’s all-time leader in assists (538) and free throw percentage (.830)…she was also among the Sun Devils’ all-time leaders in steals (second, 272), free throws (second, 401), 3-point field goal percentage (fourth, .399), 3-point field goals (fifth, 132) and scoring (seventh, 1,317 points)…in 2008-09, she set the school’s single-season record for 3-pt field goals (65)…she is the only player in school history to lead the team in steals and assists four straight years. 2008-09: Ranked second in the nation in 3-point FG pct. (.469) and 12th in assist-to-turnover ratio (2.1-to-1), January led the Pac-10 in assists (4.7), 3-point FG percentage (.469) and assist-to-turnover ratio…she was second in steals (2.3) and fourth in FT pct. (.840)…she averaged 13.8 points, 5.8 assists and 1.5 steals in ASU’s four NCAA Tournament games…she scored a career-best 25 points and tied a school record with seven 3-pointers in ASU’s 73-59 win at UC Davis, 12/3…she nearly posted a double-double with 10 points, nine assists and two steals in ASU’s NCAA first-round win over Georgia…she matched her scoring high in an NCAA Tournament game with 22 points to go along with five assists, two steals and a block in ASU’s 84-69 win over Texas A&M in the Trenton Regional semifinal, 3/29. 2007-08: She was selected an All-Pac-10 All-Academic Honorable Mention…she finished the season ranked first in the Pac-10 in free throw percentage (.864) and steals (2.18) while ranking third in assists (4.39), fifth in assist-to-turnover ratio and 15th in scoring (11.3)…she scored in double figures 23 times, including a 22-point performance against Texas, 12/22… she averaged 13.8 points while connecting on 55.2 percent of her shots (16-29), including 54.5 percent from beyond the arc (6-of-11), and 85 percent of her free throws (17-of-20) in ASU’s four Pac-10 and NCAA Tournament contests. 2006-07: An honorable mention All-Pac-10 selection, she finished third in the league in steals (2.1), fourth in assists (4.0), fourth in assist-to-turnover ratio (1.67-to-1) and sixth in free throw percentage (81.7)…she also earned Pac-10 Honorable Mention Academic honors…a starter in 34 games, she led ASU in assists and steals and was second in scoring (10.2) and free throw percentage…in the postseason, she averaged 14.0 ppg while connecting on 26-of-28 FGs (.929) and 10-of-19 3-pt FGs (.526) in the Pac-10 and NCAA Tournaments…she posted season-best numbers in points (22) and steals (6) in ASU’s 80-69 win over UCLA, 2/18. 2005-06: She was named to the Pac-10’s All-Freshman Team after a season in which she led ASU in assists (86) and steals (46)…her 86 assists represented the second-highest total ever for a Sun Devil freshman…she had one or zero turnovers 13 times…she turned in an outstanding effort in ASU’s 62-59 upset of No. 11 Stanford, 2/16, leading the team with a season-best 13 points to go with six assists and four steals. Full name is Briann Jolie January…she was born January 11, 1987 in Spokane, Wash…she majored in Education and Society at ASU…her father Barry is a karate instructor and her mother, Sally, is a teacher…she has a younger sister, Kiara (19)…Briann holds a black belt in karate…a 2005 graduate of Lewis and Clark High School in Spokane, Wash., she earned first-team all-state honors from both the AP and the Seattle Times as a senior…she earned WBCA High School All-America honors in 2005, in addition to being a four-time, first-team All-Greater Spokane League honoree…she led Lewis and Clark to a 25-3 record and an appearance in the state semifinals as a senior, averaging 13 points a game in her final season…she was named the team MVP in each of her four seasons…she earned second-team all-state honors as a junior in 2004 and was a 2002 BCI All-American as a freshman…a four-year letterwinner in both basketball and track and field, she captained the basketball team all four seasons and served as a team captain in track and field as a senior…she won the state high jump title in 2004, with her personal best in the high jump being 5’8”…she played club basketball for the Spokane Stars.